I’m on my way to Europe for a week, cobbling together the first leg of a 26 day trip that will take me to The Hague, Hamburg, Manitoulin Island, Thornbury Ontario, and New York City. On this leg I’m flying with Jet Airways, an Indian carrier that is in the throes of financial troubles at the moment, but I’ll cross that bridge when I come to it. At any rate, this flight from Toronto to Delhi stops in Amsterdam and so it is full of a mix of travellers of all ages and every ethnicity you can imagine. There are people wearing visible symbols of at least four religions. There is a baby in the row in front of me and a serene half blind nonagenarian Indian woman wearing a Ferrari t-shirt and surrounded by four generations of her family who are doting on her and caring for her. I never really watch movies on long flights, preferring to read and sleep to music or long rambling podcasts that remind me of being a child, falling asleep to the radio, fading wakefulness snatching at half-heard phrases in the dim glow of the radio dial. On overnight flights like this I like to grab a north facing window seat to pass the time looking for meteors (saw two) or the faintest hints of the northern lights. I do however keep the live map on, feeding another fascination from childhood – geography. I have an incurable attraction to maps of all kinds. 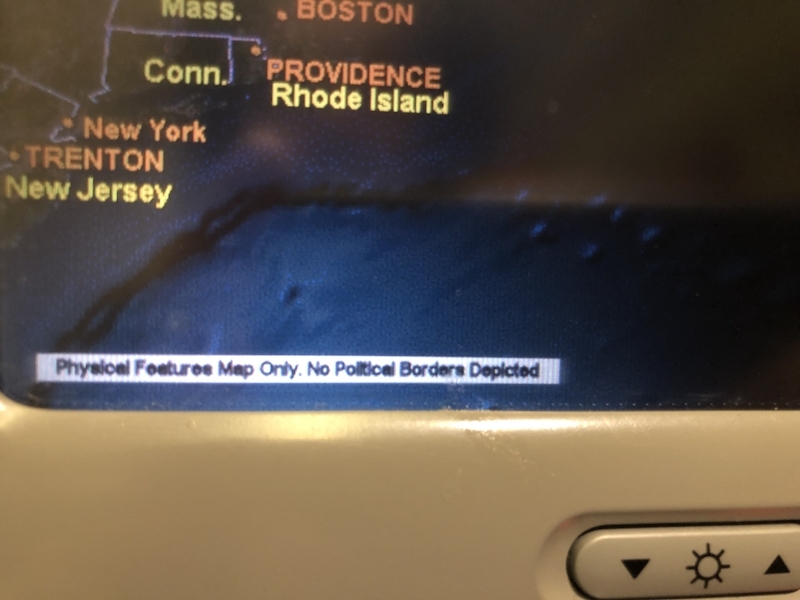 On the interactive map on this flight comes a small disclaimer: “Physical Features Map Only. No Political Borders Depicted.” Given the kind of airline this is and the huge diversity of its passengers I can see why they do this. There are no national borders depicted, only state boundaries, provincial boundaries and, inexplicably, the Welsh and Scottish borders with England. The map has roads, cities, mountains and water labelled. Truthfully, to understand earth, this is all you need. Cities are the most enduring human features on earth and the roads that connect us are also ancient, both can be thousands of years old. The political lines are the most arbitrary feature – practically drawn in pencil in historic terms – and yet are the ones that inflame the most passion. I’ve had a long standing aversion to nationalism born from my experiences as a temporary immigrant in Thatcher’s Britain where British nationalism was trumpeted by the National Front and parroted by some of the boys at my school who made sure to add that to the arsenal of insults and physical abuses that were unleashed upon me from time to time. So something about this small message gives me peace, even though I understand the reason for it. Those national boundaries are not necessary in order to understand where you are on earth. They are as ephemeral as the very idea of nationhood, and are nothing up against the mountain ranges, cities, rivers, lakes, and oceans upon which the lines are childishly drawn. Hi Chris, thank for this post. Greetings from Wolfville, Nova Scotia. I appreciate how you tell this story, share your humanness, and share a big message through an airplane map 🙂 Safe travels. Great to hear from you Duncan. Thanks Chris for taking us along on this thoughtful flight. I like to read your posts and appreciate your insights and this one connected with my own appreciation a good story, travel and geography.